Walk, bike, relax, explore from Charming 2/2 Casa. Tucked into historic downtown neighborhood is CASA ELENA. With it's private gated zen like garden & brick floor patio. You can light your chimena w/pinon, dine al fresco, lounge with a book or stroll to the plaza only 8 minutes away! 2 bed 2 bath, Saltillo Tile, oriental carpets, Vegas, Kiva and original art grace all rooms. High End bedding and leather furniture, quality comfy mattress's, all cotton. Sleeps 4. Off street parking for 2 cars is a plus. 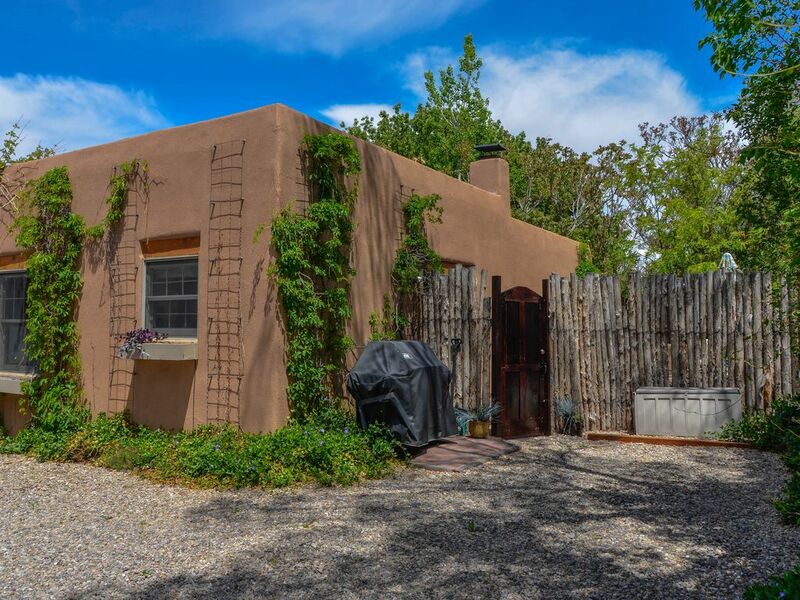 This ultra quiet home has everything you could want while spending time in Santa Fe. We have 2 other units in case you are looking for more! Our cleaning staff is superb with great attention to detail. Well outfitted kitchen, radiant floor heat, Ductless AC for summer. KING BED in master, QUEEN BED in 2nd bedroom, each with their own bath. Kiva Fireplace. LICENSE BY CITY OF SF. If cancellation: Standard VRBO/Home Away policy: 60 days/100% 30 Days/ 50%. If needed we maybe able to offer you a rescheduling of your booking so you don't loose any funds. Pretty cool eh? Both of us have been involved in Hospice. Author of several published works. Labyrinth facilitators, creators of sacred space and women's circles. Quiet. 2 parking spaces. adobe style accents such as cove ceilings and nichos. Proximity to restaurants, plaza, night life, the Lensic theater, De Vargas shopping center, walking areas, too much to mention. toilet, shower, Located in master bedroom. Nice step into shower. Literally 8 minute walk to the famous Plaza. No local phone on site. Ductless AC system. Located in both bedrooms. will cool entire house or single bedrooms if you leave bedroom doors open. Large LG models 2 washing pods provided on inside rack of laundry closet. Cable TV, Leather sofa and club chair, Leather rocker. Cove ceilings throughout. No Ice Maker but we have ice cube trays provided. Spices, coffee filters provided, assorted condiments like S&P, sugar, creamer. Fully Stocked: Dining for at least 6. Pots, pans, crock pot, blender, grater, spatulas etc. Gas Stove, granite counters, fully stocked with cooking pots and pans, etc. We supply coffee filters, coffee beans, grinder too. Sugar and Creamer supplied. Some spices are on site. Beautiful private brick patio, surrounded by garden, twinkle lights in the evening magically come on. Gated and able to lock. Santa Fe ski basin is aprox 18 miles away. Hand bars in Master Bath. Single floor. Small 6" step up to enter casita. Living room, Kitchen, Dining and Hall bath all open. This home is very well appointed. All beds are very high quality, all furniture is leather, or custom built for the home. Original art in every room by artist Local water color artist TODD WINTERS, formally of Taos. Sun Light fills the home by day, and Exterior Twinkle Lights come on at dusk. A favorite home for repeat visitors to Santa Fe. The property was well maintained and great location. The experience was great with the exception of the cats on the roof at night. The coach and large chair were uncomfortable. Too soft to sit in. But overall the place was great! Well maintained property. Within walking distance to interesting points in Santa Fe. Adorable home full of Santa Fe style and charm! I was here with a work colleague for 3 nights. The layout with two bedrooms and two baths provided us privacy. This bright and cheery house has everything: comfortable beds, soft towels, reading lamps, new washer and dryer, a well-appointed kitchen that even had a blender and food processor. Everything was clearly labeled, and notes from the owner anticipated questions and were comprehensive. Excellent location a few blocks from the Plaza. If warmer, we would have enjoyed eating in the private garden patio. The front door can only be unlocked with a key from the inside, so for fire safety, keep the key in the lock when in the house. Also, for great local treats,do NOT miss Chamisa Chocolate and Porter & Drift bakery at the Sunday Farmer’s Market - Yum!! Can’t say enough about this stay. We would love to return to Santa Fe and this home in a heartbeat!! Great location to Plaza, easy to walk to restaurants and shop. Property was clean and comfortable perfect for our needs. Very pleasant and convenient to the plaza and rail yard areas. The property was very clean and well appointed with all the necessities. Everything worked well, beds were comfortable, it was quiet and quaint. Arrival and operating instructions were easy to follow and well organized. I thought the cleaning fee of $150 was a little steep for two people that don’t make a mess. It would be nice to refund some if the property is left in good order. But I suppose it’s hard to manage that. It’s also a little smaller than the pictures give you a feel for. Maybe listing the square ft would be nice. Overall an excellent property, everything worked, was clean, organized, and charming. We enjoyed a pleasant and comfortable stay at 111 Elena. The casita is well equipped and quiet. There is a wonderful used book store just up the street with old maps of this area in particular. Our place is close to the Plaza and is convenient to De Vargas shopping plaza, art galleries and other places of interest. I would highly recommend staying at 111 Elena. This location is hard to beat. Very short 5 minute walk to the Plaza & all the galleries, shops. Walk to the Lensic Theater, the Agave lounge, Thai-Italian-New Mexican restaurants all within walking distance. 1. Cleaning Fee higher when stay is longer than 7 days. Our home is immaculate and our housekeepers spend time going over all surfaces, drawers, cabinets. 2. Read Agreement and Rules.